4. The new Shingles vaccine (Shingrix) and updated information on the virus and CDC recommendations for you! 5. Kratom is dangerous substance—new alert! 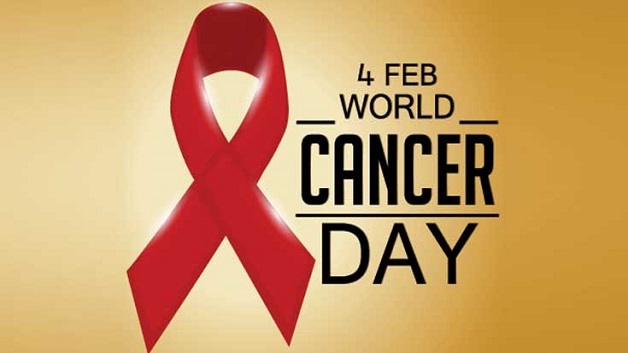 February 4 was World Cancer Day. 9 million people around the globe die of cancer each year. As a cancer survivor since 1991, I am living proof that early detection increases cure rates. Get screened and don’t ignore persistent symptoms. Be wise and help those who might be denying issues that are potentially serious! Most people do not understand the difference between ligaments, tendons, and fascia. They are all protein fibrous connective tissues that connect bones and joints, and cover muscles and provide support. These tissues can be injured causing pain and inflammation. Injuries are defined as sprains and strains. A sprain is an injury to ligaments whereas a strain is an injury to muscles or tendons. Degrees of strain or sprain imply tears in these tissues. This report will limit the discussion to 2 common injuries: tennis elbow (epicondylitis) a tendonitis (-itis emplies inflammation), and plantar fasciitis, technically a fascial layer but similar to a tendon that is sprained (some degree of tear). Both present with the same symptoms—pain, swelling, some redness (inflammation), and disability. The inflammatory process is the normal way the body heals injuries. The body sends white blood cells (mast cells and macrophages) to clean up the injury secreting certain chemicals to dissolve the damaged tissue cells, and also increases blood supply to assist in healing by bringing increased oxygen an injured area, and hopefully provide healing of the injury. Unfortunately, some of these injuries are resistant to healing and are easily reinjured before they have time to completely heal. When healing is not complete, scar tissue and degeneration occurs causing continued symptoms and vulnerability to re-injury. This discussion involves 2 common injuries difficult to heal—tennis elbow and plantar fasciitis. Any sport or activity using the hand to grip (tennis, golf, carpentry, baseball, etc,) can cause this injury. 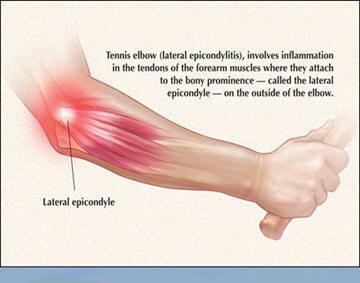 An example of a tendon injury is tennis elbow or technically called epicondylitis (tendonitis), an injury from many activities. The forearm muscles insert into tendons into outside projections of bone (epicondyle) of the humerus (upper arm bone) at the elbow. If that tendon tears even slightly, it will cause severe pain with use. 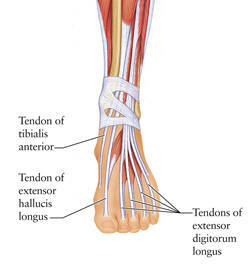 Inflammation in the tendon occurs and is difficult to heal. The drawings below show the anatomy and where the injury occurs (lateral epicondyle is the projection of the outside of forearm bone (humerus). The initial treatment is rest, use of a band or strap over the area to splint it from movement when using the hand, ice compresses 3-4 times a day, and anti-inflammatory medications (Aleve, Ibuprofen, etc.). When the area has time to settle down (1 week or more), gentle exercises to stretch this tendon are recommended (see drawings below). 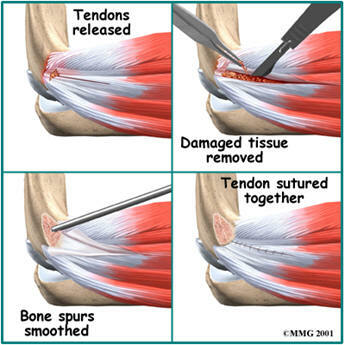 Cortisone injections may be necessary, and in rare cases (5-10%), surgery to release the entire or part of tendon from the epicondyle, and then let it heal with new scar tissue. Patience is the hardest part. Tennis elbow pathology shows inflammation from a tear in the tendon at the epicondyle--extensor radial muscles(forearm) attachment. Below is a drawing of the inflammatory process that occurs in this tendonous attachment, and either an endoscopic approach or open procedure may rarely need to be performed to relieve the issue. Below are drawings of these approaches. 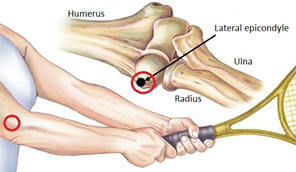 A boney spur may be present after repeated injuries and can be removed when the tendon is repaired. 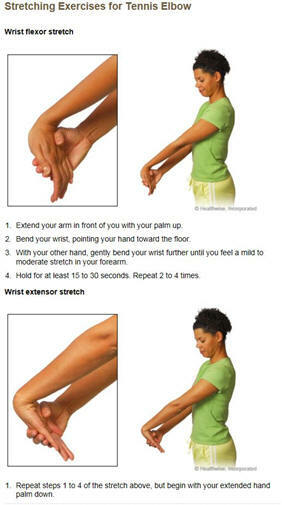 Rehabilitation must include gentle stretching exercises as shown below. There are numerous alternative therapies that can successfully treat tennis elbow, and I will discuss them when reporting on plantar fasciitis later in this report. 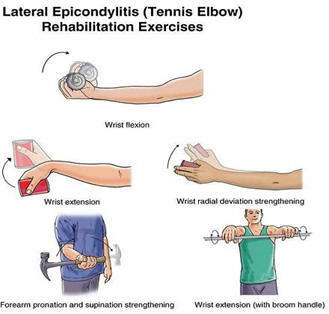 Below are the classic exercises necessary to strengthen the forearm and stretch the tendons associated with tennis elbow. These exercises are a necessary part of the treatment protocol as it heals. For tennis elbow, a strap just in front of the tendonitis will help splint the area to reduce movement when using the hands. These splints can be purchased at drug stores, WalMart, and sports facilities. 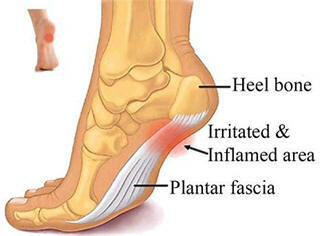 This is a very painful inflammation in the bottom of the foot usually occurring in front of the heel or even in the heel. 85% of those affected are working age (25-65) and this injury affects about 10% of the population. 22% are runners and 65-75% of those afffected are overweight. The injury occurs where the plantar fascia inserts into the heel bone (medical name is calcaneus). 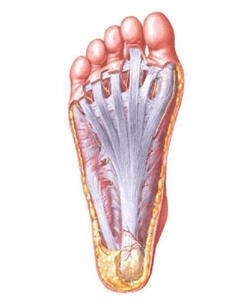 With too much tension pulling on the fascia from the toes, mini-tears occur at this insertion of the fascia. Point tenderness is usually present and a tender fullness may be felt just in front of the heel from swelling. For runners, it is excessive overuse from over-pronation of the foot. Over time and repeated inflammation, a bone spur may form. Over a million visits to doctors and podiatrists occur every year. Tears closer to the bone! The plantar (means foot) fascia is made up of a group of 3 tissue bands on the bottom of the foot made of collagen (protein). It is quite similar to tendons and ligaments which all support bones and joints. 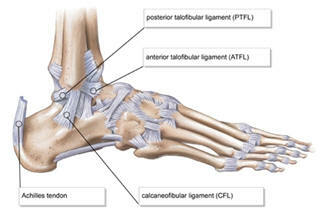 As stated, the fascia originates behind the toes and inserts onto the heel bone (calcaneus). When it is strained (torn), it causes inflammation usually where the fascia inserts on the heel (see above drawings) bone, causing severe pain just in front of or in the heel, especially as one first stands on the foot, which may become less severe after walking several steps. It is more likely to occur in overweight people, those with tight calf muscles, high arched feet, those who wear poorly supported shoes, and those very active in sports especially runners. The plantar fascia acts to provide support of the arch (preventing flat foot) and also acts as a shock absorber for the foot. 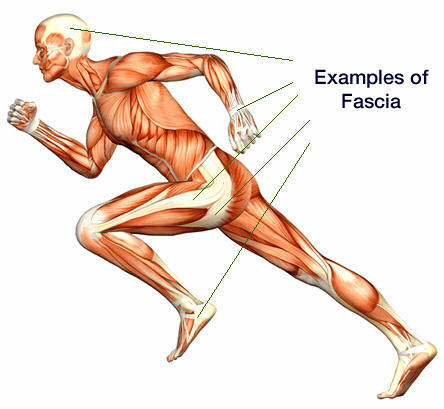 Over time and reinjury, a degenerative process occurs with thinning of the fascia. Aging also thins the heel pad aggravating the issue. Orthotics and instep support in shoes is critical to prevent and treat this injury. These orthotics are best recommended by a specialist or a store that sells special sports equipment designed to prevent these injuries (there are foot stores now). If over the counter orthotics are not helping, please see a podiatrist or orthopedist who has special training in foot and ankle disease, but expensive custom made orthotics are not thought to be much better than ones that can be purchased over the counter. Certainly follow the advice of the specialists. 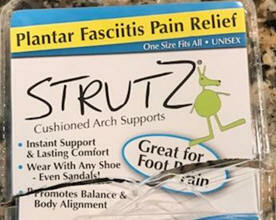 An orthotic that goes on your foot and can then be used in a variety of shoes is available at WalMart, online etc. called Strutz. ($ 8.00 and it helped me). Physical therapy consults may be very helpful . 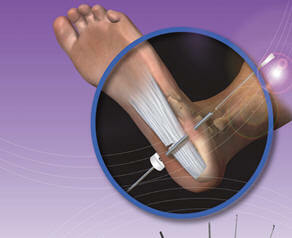 In certain cases, steroid injections (cortisone) into the site of pain can relieve the problem. If an injection is performed, care must be taken for a few weeks to not overdo exercise as this area is vulnerable to rupture and further damage and pain. 3 steroid injections 2-4 weeks apart are the maximum amount that is recommended in any one year. Time is a critical factor in healing these injuries and will take a few months to be resolved. Night splints for plantar fasciitis to keep gentle stretching on the plantar fascia (flexing the big toe) may be helpful as well. Icing 3-4 times a day with or without heat at other times is often recommended using an ice pack that contours to the bottom of the foot. Rolling the foot over an ice pack (or frozen bottle of water) back and forth will compress the plantar fascia with stretching and help with pain and swelling at the focus of the inflammation. There are many alternative treatments today that have some value, and most of these treatments have mixed research results but are aggressively marketed. For best results, it is the combination of anti-inflammatory medications, steroid injections (to reduce inflammation), time, care not to reinjure the area with movement, special taping, orthotics, physical therapy with massage, and stretching, that will provide resolution in as many as 90% of the cases. For resistant cases, these alternative methods may be valuable. Stem cell injections are being used, but the research is not yet in on these expensive experimental treatments. Cryotherapy uses a probe introduced through the skin that freezes the area, which may stimulate new healing. Acupuncture with or without electrical stimulation techniques have been successful in some cases. Blood or platelet rich plasma (the patient’s own) into the area causes an inflammatory process that may stimulate the healing process. This applies to tennis elbow as well. 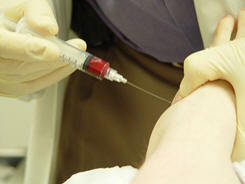 The photo shows injecting the blood into the joint of the arm. ESWT—Extracorporal Shock Wave Therapy is an FDA cleared (not approved) new technique for tennis elbow and plantar fasciitis that may have value. The apparatus sends high pressure sound waves that stimulate blood flow to the area and reduce inflammation by creating new tissue injury thus allowing the body to heal the site. 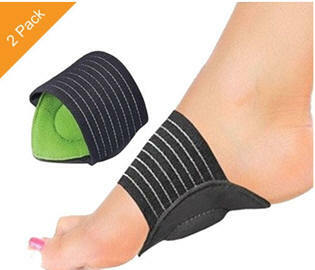 It is too soon to know if this is the future for any tendonitis or fasciitis. 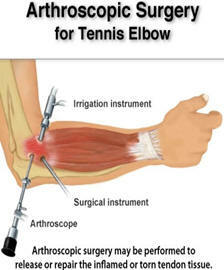 This also applies to tennis elbow. These techniques are not covered by most insurance companies. 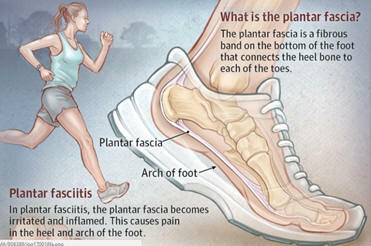 If a heel spur is present, this may require surgical removal if plantar fasciitis recurs. 90% resolve with conservative measures no matter what measures are taken. 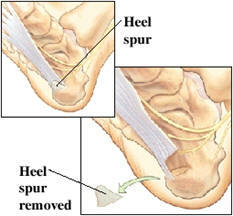 Below is a drawing showing removal of a heel spur and partial removal of the degenerated tendon. This can be performed endoscopically or as an open procedure. Considering the smaller incision with endoscopic surgery, it would seem reasonable to seek out a specialist in this procedure. Orthopedic surgeons perform many endoscopic procedures. Medicine is an inexact science. It is important for patients to know the solemn responsibility physicians accept in the care of all patients regardless of any personal social and political ideologies they have. This has become much more important with the influx of so many races, colors, creeds, religions, etc. In a crisis, just as in hurricanes, healthcare professionals do not discriminate when people are in distress and reaching out for help. It is commonly quoted that the Hippocratic oath states, “when in doubt, do no harm”, however, although those words are not actually in the oath, the spirit of it is. Physicians go into medicine to help people! The issue of medical errors is a difficult area to discuss. It is not easy to admit a mistake for anyone especially when it pertains to caring for patients. Doctors make mistakes and learn from them like all professionals, however, physical and or psychological harm can come from these errors, and with the legal profession on alert at all times, doctors pay not only financially but suffer psychological pain knowing they made a mistake and caused harm. Medical practice presents a constant challenge to clinicians, because the variables each patient present with are so different even with the same disease. How a patient presents with an illness, how they respond to treatment, how well they follow the doctor’s orders, and how other co-morbidities (other diseases the patient has) affect the outcome of illness, determines the outcome of any treatment. It is also this challenge that draws a person to choose the medical profession. It is why I chose the medical profession (yes, even with all the barriers in the current medical environment). Keeping up with medical advances is a huge challenge but the responsibility of every physician. Doctors must present to the Florida Board of Medical Licensing 30 hours of continuing medical education credits every odd year to keep an active medical license. For initial licensing and renewals, 2 hours of education regarding prevention of medical errors is required. Writing THE MEDICAL NEWS REPORT each month has allowed me to update my knowledge in most fields in other than my own head and neck specialty much more than when I was in practice. (my specialty was Ear, Nose, and Throat Surgery, Facial Plastic, Cosmetic, and Reconstructive Surgery, Head and Neck Cancer Surgery). During my 30 years of practice, I had to learn new techniques and innovations in my field leaving little time for staying up on other fields of medicine. Can you imagine trying to stay up with all the information a primary care doctor has to? That is why they must rely on specialists when medical issues get complicated. The medical profession is expected to be error-free, and they are not. No wonder there are more referrals to specialists today for fear of missing an underlying disease. And yet there are insurance companies and major medical centers that dock a primary doctor’s pay if they request too many consults. That is where the responsibility of the patient should come in, because doctors are being forced to see more patients to make up for decreasing reimbursement or required as an employee. It is no time to be a “passive” partner because assisting the physician in one’s own healthcare has never been more important. That is why I share these reports with hundreds of people to empower them to learn more about their medical conditions. My reports are just the beginning to encourage patients to do their research about the illnesses they suffer from and be knowledgeable when they have a doctor’s visit. With new drugs and treatments that manipulate the body’s immune system (for example), side effects have mounted. Reading about potential side effects of medications be taken should be every patient’s responsibility. Drug interactions increase with taking multiple medications. A person over 70 years of age takes an average of 6 different medications per day. The government and national medical organizations have, by necessity, begun to provide evidence-based medical and surgical guidelines for most major diseases because doctors can’t keep up with all the medical advances as the pace of medicine continues to increase in speed. These guidelines, however, are just that…they are not laws on how to practice medicine. They are only guidelines but cannot take every variable into consideration for each patient. That is why, at the end of the day, deciding medical plans are between patients and their physicians, and not bureaucratic organizations that can only provide guidance based on sound medical research. I have spent the last 7 years helping write these guidelines for the American Cancer Society regarding screening for cancers. Missing a diagnosis, choosing the wrong treatment, contending with side effects of treatment, managing other illnesses that affect a treatment, knowing when to refer to a specialist, and realizing something is going wrong takes experience and knowledge. When a treatment is not working, alternatives must be decided on, and when in doubt, doctors should reach out for other opinions. And yet, when something goes wrong, patients quickly lose confidence in their doctor and start the blame game. These difficult times are best handled with the truth about an error that might have inadvertedly occurred. Trying to cover up a mistake is the worst thing a doctor can do. Being honest is the best policy. Doctors are human and make mistakes. That is why doctors with a good personal relationship with their patients are less likely to be sued. Malpractice is a dirty word, but that is what it is called. There are times when mistakes are made, and in this litigious society, someone will likely pay. There are areas in medicine that come with much more hazard than others. Informing patients about risk is the responsibility of any doctor, and understanding it is the patient’s responsibility. It is critical for patients to study on their own health issues, and these reports are a good place to come to as a resource. Trusting the internet is tricky and often unreliable. Patients want to rely on their doctors to make decisions, but the patient needs to help guide the doctor’s decisions with thoughtful questions, following orders, and informing them immediately when there is a problem. In one study, 20.6% of all medical care was considered unnecessary as reported by a number of physicians across all specialties. In addition, 22% of prescriptions, 24.9% of tests, and 11.1% of procedures are unnecessary according to these physicians. Reasons given for these figures are: fear of litigation and the pressure from patients to over-treat, difficulty accessing patient records, lack of adequate information from patients and previous treating doctors, and pressure from healthcare facilities that doctors are controlled by as an employee. Fear of malpractice continues to be a serious issue on how doctors practice medicine raising the cost of healthcare as pointed out by the above figures. Many medical errors occur in the hospital due to the complexity of the illnesses treated. The Washington Post, cited an article in the British Medical Journal, that medical errors are the third leading cause of death in the U.S. (251,000) behind heart disease and cancer. 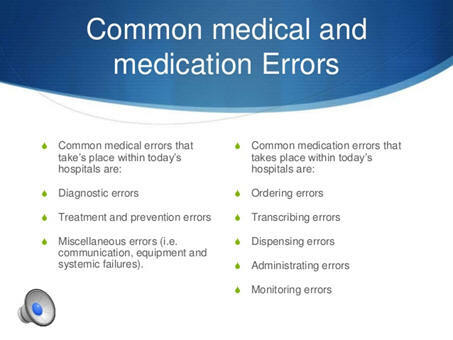 Medication mistakes are the most common error in the hospital. 1 in 5 patients will experience a medical error in their lifetime. Consider the number of prescriptions Americans take (1.3 billion in 2016), the number of illnesses and procedures performed, and now the U.S. population exceeds 323 million people (2016 statistics). Patient safety should always be a shared responsibility between medical personnel, patients, and families. Patients must report side effects so that their physician can deal with them and make sure it is posted in the medical record. CMS (Centers for Medicare and Medicaid Services) is addressing this issue in one way by reimbursing doctors and hospitals based on quality of care rather than fee for service. Now more than ever, patients must do everything they can to improve their health by stopping unhealthy habits, lose weight, and follow doctor’s orders. Medical errors occur every day and even though they may be relatively minor, they are unacceptable and must be reported and corrective action taken. There are potential medical errors inherent in medical care delivery. There is a difference in an accidental medication error and operating on the wrong side of a patient. One article stated that there are still 40 operations per week that are performed on the wrong side. These are easily preventable with operating room standards, and yet they continue. I would like to know what kind of a facility is that careless knowing the strict rules in place in operating rooms. Even though errors occur on a daily basis, consider there are 950 million doctor visits per year. The stress of seeing more patients per hour and now adding the time to document the visit in an electronic medical records, it sets up an environment for errors on the chart, dosage of medications, and forgetting to check if a patient is allergic to a group of medications. Errors in electronic medical records will be perpetuated easily for months and years until the error is discovered and corrected as other doctors review these records. Missing a diagnosis is another issue. 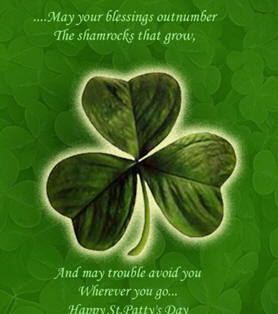 With little time for examinations, problems can be overlooked or missed. X-rays can miss small cancers, and EKGs could miss an intermittent cardiac irregularity. Patients often do not bring symptoms to their doctors or are untruthful about their habits. Deaths can occur with complicated illness especially in the hospital and are the third leading cause of death in the U.S.—200,000 per year. Bed sores, hospital based infections, blood clots, embolism, surgical errors, and complications from treatments all account for this statistic. Most are not preventable but many are! Medical errors are part of the reason that insurance companies (particularly Medicaid and Medicare) are changing the reimbursement method for hospitals and physicians to a quality of result payment. For instance, readmission to the hospital from a complication may not be covered regardless of cause. Medicare payments to hospitals and doctors may be reduced for not meeting quality standards or now not having an electronic medical record. It is no wonder that more and more physicians are fed up and have decided to become employees rather than weather private practice and all the regulations that have strangled healthcare. There are plenty of critics regarding this information, but here is why I bring it up…..be aware of these issues and team up with your physician to help ensure medical errors do not occur. Check your prescriptions and dosages, know when to take your medicine, read about side effects and immediately report them to your doctor, take medications only as prescribed, and never stop a medication without discussing it with a physician. A patient needs to know about their own health issues! Patients must question diagnoses and treatments. Ask the doctor about expectations of a treatment, the potential complications, and recovery time for a surgery or medical treatment. Also if a patient is older, make sure an elective procedure is really necessary and what success can they expect. Never let an elderly patient see a doctor without a family member present to hear instructions. Medical malpractice continues to increase the cost of medical care. Unfortunately, the majority of physicians will be sued one or more times during their career. Many doctors are paying over $100,000 a year for malpractice insurance per year, and it impacts the cost of healthcare. Lawyers have forced the insurance companies to settle out of court most of the time to prevent a lengthy expensive trial, and doctors are many times forced to go along with the insurance companies even when they are not actually negligent and settle out of court. The lawyer ads on TV alone tell the story. There are cases where actual negligence and incompetence deserve compensation for physical and emotional disability, and plaintiffs are increasingly being rewarded for “pain and suffering”. The following are the results of the analysis of 4000 physicians over all specialties reported in the internet journal, Medscape. The impact on the physicians and patients having to endure a lawsuit is often overlooked, but it has created defensive medicine in this country and needs to be reformed. Lawyers receive 40% of most lawsuit judgments, whether they go to court or settle out of court. All parties want to settle and how lawsuits are litigated must be changed. Arbitration boards should be the answer and they are in some cases as is mediation. Class action suits are part of Big Pharma’s cost of doing business, and they pass the costs on to the patients. The same is true for hospitals. Doctors can’t charge more because most insurances will only pay a certain predetermined amount based on coding. More than half of all physicians are sued at sometime in their practice. Physicians may be sued individually or be involved in multiple physician lawsuits including hospitals and other medical facilities. 85% of general surgeons and OB/Gyn doctors experience a lawsuit with 70% plus of ENT, Urology, Orthopedics, Radiology, and Plastic Surgery are named in a suit. Almost half of these specific specialties experience 2-5 lawsuits during their career. I had one lawsuit in 30 years while in practice, but paid premiums for malpractice insurance for all 30 of those years. It is thought by many that doctors who have lawsuits are inferior in quality, however, many times these doctors have higher risk patients that are more likely to have complications. This is especially true in large referral medical centers. 87% of physicians were very surprised or somewhat surprised when they were named in a suit with only 13% not surprised. -31% of the suits arose from a missed or delayed diagnosis. -27% arose from complications of surgery. -24% from a poor outcome of a treatment. -17% from a failure to treat or delayed treatment. -16% from wrongful death cases. It takes 1-2 years for a lawsuit to be resolved in 39% of the cases and 35% take 3-5 years. 82-90% of suits are settled out of court. Of those lawsuits who went to court, only 2% favored the patient (this is why lawyers want to settle). Almost all physicians have malpractice insurance although in most states, it is not required. Over half of physicians were either coerced or required to settle the lawsuit by their insurance carrier to prevent a trial because of the extreme cost and years of work. Plaintiffs were awarded up to $100,000 in 33% of the cases, with 35% up to $500,000. Sadly, lawsuits change the way physicians view patients. 26% did not trust their patients or viewed them differently. 6% quit practice. However, only 30% felt that the lawsuit negatively affected their overall career. It did not affect my practice but certainly was a huge burden on me which I carried forward even though the surgical complication was unavoidable in removing a tumor. Better chart documentation by physicians was cited as the most likely to protect from future lawsuits. The emotional impact on patients is obvious, but it may not occur to the public what a devastating experience it is for the physician. Defensive medicine is on the minds of most physicians whether they are sued or not, but in this study, over 45% of physicians surveyed had the threat of a suit on their minds almost all of the time and one third stated it influenced the way they treated patients often ordering more tests, requesting more frequent visits, and generally feeling they needed to do more than they did if the threat of a suit wasn’t present. And yet, only 16% of physicians turned away a high risk patient. Better communication with patients was cited as the most important way to prevent litigation! Over two thirds of physicians feel that medical organizations are not doing enough to reduce lawsuits. It is important to note that epilepsy and seizures are not exactly the same. There are many types of seizures that are much more subtle than the classic grand mal seizure with the classic jerking movements. Two main categories include partial and generalized seizures. A seizure is abnormal electrical event in the brain and can be seen on an EEG. It usually occurs from an abnormal focus of electrical activity in one of more specific areas in the brain. 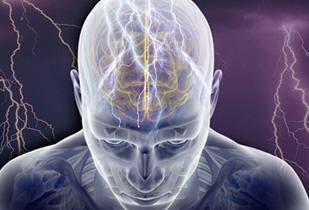 Seizures are categorized by the activity observed during the event and the syndrome is called epilepsy. Below is an EEG (electroencephalogram) with brain waves that are normal and one that demonstrates seizure activity. Epilepsy is seizure activity with certain motor or sensory signs and is a collection of signs and symptoms called a syndrome that are recurrent. There are many people who just have one seizure and never have epilepsy, which implies recurrence of episodes of activity including electrical seizure activity. These seizures are subclassified into simple and complex. They are frequently defined by the area of the brain that is involved (i.e. frontal lobe or temporal lobe seizure). Temporal lobe seizures are the most common type of focal seizure. These simple partial seizures can involve a very small area of the brain. 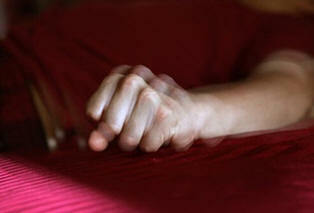 Depending on the focus, a finger or hand may jerk or other movements of one arm. The patient remains conscious but may experience unusual feelings or sensations (smell, taste, sudden joy, anger, visual, nausea, loss of hearing, feel numbness, or weakness). These complex seizures create an alteration or loss of consciousness as opposed to the simple partial seizures. They are defined by the area of the brain involved such as the frontal or temporal lobe. They may be manifested by repetitive movements (called automatisms) such as picking at the air, twitches, blinking, lip smacking, making noises, repeating phrases, laughing inappropriately, or even walking in circles. These movements are involuntary. As opposed to generalized seizures, if the extremities are involved, they are only on one side of the body in focal seizures. Because they involve areas of the brain that involve alertness or awareness, they can result in daydream states and usually last only a few seconds. If they were performing some act before they have these seizures, they usually go back to that activity. These seizures involve most of the brain even if they start in one site. These seizures involve both sides of the brain and are associated with staring into space, jerking, or twitching movements, loss of consciousness, or falling down. If somewhat limited in motion (eyes twitching, lip smacking, etc., they were named petit mal (“little seizures) in the past. Genralized seizures may involve stiffening of the extremities (tonic type) or repetitive movements (clonic type) or both (tonic/clonic-grand mal seizure are now called myoclonic seizures. Their teeth may bite their tongue and secretions (saliva) may spill from the mouth. They may or may not stop breathing during the event. Many will fall to the floor losing bladder and bowel control. These seizures usally can last up to 3 minutes but if over 5 minutes, it is a medical emergency and someone must call 911. Following the seizure, the patient is usally in what is called the “post-ictal” state, feeling very drowsy and disoriented, with no memory of the seizure. There are also atonic seizures in which the person goes limp during the seizure and can be confused with narcolepsy. These seizures may begin as a focal seizure and then progress into a generalized seizure. Because there are so many types of seizures and many are mislabeled, there is great misunderstanding in epilepsy. These patients may have auras before having these seizures (similar to classic migraines) signifying the seizure is coming. Actually they are simple seizures preceding the complex partial seizure and are usually the same each time. Migraines can have auras as well. These seizures can be confused with migraines, narcolepsy, fainting, or even mental disorders called non-epileptic events. Tourette’ syndrome and cardiac arrhythmias can be added to the list. A person begins this activity from 4-14 years of age and are observed to appear staring aimlessly for a few seconds staring into space with no recollection of the event. It can occur many times a day. These seizures can go undiagnosed for years due to the subtle nature and shortness of the episode. Parents may think they are just not paying attention. Children usually stop these types of seizures at puberty. Most disorders may be caused by genetic mutations (hereditary), lack of oxygen at some time from birth throughout life, strokes, sudden high fevers (febrile seizures) infections of the brain, head injury, or brain tissue alteration from a disease such as Alzheimers, brain tumors, eclampsia, and acute withdrawal from alcohol. There are at least 500 genes thought to be involved in epilepsy. There is intensive research on neurotransmitter chemicals, specifically GABA (gamma-amino-butyric acid), which actually inhibits neurotransmission, which may make the neurons less excitable. In a focus of brain tissue where a seizure begins, it is theorized that there is damage to normal transmission of nerves, and abnormal burst of activity create a chain reaction which then causes a seizure. There is research on the membranes of neurons, which are responsible for a neuron to stimulate an electrical impulse. Glial cells in the brain have some influence on nerve impulses too, since they regulate chemicals in and out of the nerves. About one half of seizures have no known cause. There are triggers to lower the threshold. Certain poisons (lead, carbon monoxide), stress, lack of sleep, and even a flashing light or a change of menstrual cycle can contribute. Because of the obesity epidemic, obstructive sleep apnea has become a significant risk factor for seizure activity and recurrence, and it has now become necessary for a neurologist to explore the possibility that sleep apnea may be a trigger for seizure activity. Any cause that decreases oxygen to the brain will increase the likelihood of seizure activity. CPAP during sleep for apnea has been proven to decrease the number seizures by as much as 50%. This is critical new information. Any seizure patient should consider a sleep study to diagnose the possibility of sleep apnea. Most children will grow out of the disorders and 70-80% will be controlled with medication with an occasional breakthrough seizure. The school and daycare must be aware to take special precautions. Febrile seizures usually do not recur (only 2-3% recur) and don’t need medication. Scientists have discovered genes that predispose children to febrile seizures. The EEG (electroencephalogram) is the standard procedure to perform for diagnosing seizures. Special techniques may be used to increase the likelihood of seeing the abnormality on EEG. This test is a brain wave test which is compared to a normal one. CT and or MRI scans are often performed to rule out tumors, congenital abnormalities, blood clots, evidence of a stroke or scarred area. Blood tests are used to rule out chemical abnormalities such as a low blood sugar in a diabetic, lead, etc. One of the biggest concerns is loss of cognitive and memory functions. Although most seizure disorders do not cause major intellectual disability, there are many developmental syndromes that include a multitude of disabilities, they also may include seizures. The high level disabilities are not caused by the seizures rather they are the result of underlying neurodegenerative disease complexes. Being seizure free for one year decreases the risk of an accident by 93% in one study. Limitations in sports and other social activities that may harm the patient or others must all be considered. Employers are prevented by law from refusing to hire those with controlled epilepsy, however, one study cited that only a 57% of patients with epilepsy graduate from high school and 15% finish college. Epileptic women who become pregnant have a 90% chance of delivering a normal baby and a risk of about 4-6% of having a baby with a birth defect. Any seizure lasting longer than 5 minutes should be considered in status epilepticus, denoting continuous seizure activity. This is a medical emergency. About 60% of these patients have no history of previous seizures. 80% treated within 1 hour are controlled, but after 2 hours, that figure drops to 40%. There is a 2 fold increase in sudden death in these patients with no explanation. It appears to occur more likely in those with 2 or more medications necessary to control the seizures. Those who have a single seizure will need a neurological workup, however, may not need seizure control medications. Depending on the results of the EEG and scans, medication may not be started until a person has a second seizure. One study found that after 8 years, only 33% had a second seizure saving 2/3 of the patients from having to take medication after that and having possible side effects of the meds. 70% of patients can be controlled seizure-free with regularly taking their medication. A diet higher in fat with adequate amount of protein is used to treat difficult to control epilepsy. This diet forces the body to burn fat instead of carbohydrate. With metabolism, the liver is forced into using the fat for energy and breaks down fats into fatty acids and ketone bodies. This creates a metabolic state of ketosis, and the ketone bodies pass into the brain using this breakdown product of fat instead of glucose to lower seizure activity. This will reduce half of the number of seizures in half of children and young adults. There is also evidence it may help in adults. A modified Adkins (high protein) diet has also been effective. A dietician should be consulted in these cases. Patients will experience constipation with these diets. There are medical conditions that should use caution with this diet—Crohn’s disease, cardiovascular disease, diabetes, chronic fatigue syndrome, and severe acne. c) Medication is the treatment of choice for those with at least a second seizure and those without a known cause. Clinical decision making is critical in these cases. Medication choice depends on type of seizure, age, gender, comorbidities (other illnesses), side effects, and cost. Carbamezapine (Tegretol) and phenytoin (Dilantin) have become the most popular medications because of their effectiveness over 2 barbiturates—phenobarbital (Luminal) and primidone (Mysoline) according to a VA Cooperative study especially for tonic-clonic seizures (grand mal). For partial seizures, lamotrigine (Lamictal) and oxycarbazepine (Trileptal) had the best success. For generalized seizures, valproate (Valproic) and lamotrigine (Lamictal) had the most success cited in Medscape. Monitoring the blood level of a drug is commonly performed to monitor the progress of the treatment. Once treatment is initiated, there is about a 60% success rate in keeping the patient seizure free with one drug. The main concern are side effects including drowsiness, dizziness, and cognitive difficulties. These may be short term or longer. Adjustment of dosage or switching to alternate medications may be necessary. Gabapentin (Neurontin) and livetiracetam have the fewest side effects. Dosage adjustment in patients with kidney dysfunction may be necessary. Some of the most effective drugs may cause elevations in liver enzymes causing liver damage. 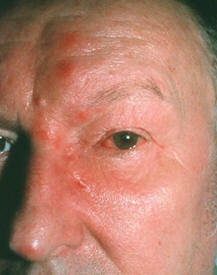 Skin reactions can be severe. Suicidal behavior may occur. Possible birth defects may be an issue with pregnant women. A blood test is necessary to detect CYP450, a genetic enzymatic system in the liver that affects the dosage of seizure medications. If the enzyme is present adjustment of the dosage is necessary. These enzyme inducers also affect some contraceptives and an anti-coagulant (Coumadin). There are other drugs that are metabolized by the liver with a slightly different enzymatic system (CYP450 and CYP3A4) that can affect seizure medications including erythromycin (Z-pak antibiotic), diltiazem (Cardiazem a heart medication0, and cimetidine (Tagamet for indigestion). There is a new and improved shingles shot, and it is recommended by the CDC even though you have received the older version (Zostavax) in the past. It is recommended to receive the new version (Shingrix), since it is about 90% effective compared to 50% from the older vaccine. The shingles virus (proper name is herpes zoster) occurs from the chicken pox virus (Varicella zoster) in childhood. The virus stays dormant in the nerves just off the spinal cord only to be activated later in life in the form of shingles. Vaccination in childhood helps prevent the potential for developing shingles (herpes zoster). The FDA recommends the vaccine for all people 50 and over (the CDC recommends 60), all those immunocompromised, and those with chronic disease (diabetes, heart disease, kidney disease, etc.). Even if a person receives the new vaccine, people can still develop the rash, but are much less likely to develop the terrible complications from the shingles virus (post-herpetic neuralgia). 1 in 3 American adults will experience the shingles virus which is a very painful blistering rash usually seen on the side of the chest wall, however, it can occur on the face or other areas of the body. 50% of cases occur in patients over 50 years of age. 1 million Americans will suffer from the virus annually. It can recur, therefore, do not be fooled that if you have had the shingles, you do not need the new shingles shot. 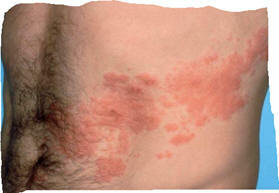 The typical rash is shown above commonly along the side of chest and abdomen in the left photo, and on the right is an example of the appearance on the face involving the eye and nose. This itchy, painful rash follows the distribution of the skin nerves and does not occur on both sides of the body simultaneously. As stated, the herpes zoster virus lives permanently in the spinal nerve ganglion (just outside of the spinal cord), and when activated, travels down the nerve ito the skin nerves causing the eruption on the surface of the skin. Tingling, skin sensitivity, and itching may occur. There is no medical way to rid the body of this virus. The Herpes zoster virus can cause permanent pain in the area where the rash occurs in about 1 in 5 cases. This is called post-herpetic neuralgia, a form of neuropathy. Rarer complications include permanent blindness, hearing loss, and facial paralysis (Ramsey-Hunt syndrome) when the face is involved from invasion of the trigeminal nerve. In my practice, I cared for many patients with facial shingles, and they were difficult management cases requiring intravenous anti-viral medication (acyclovir), corticosteroids, and hospitalization. Prevention of these severe complications are the most important reason for getting vaccinated. The CDC recommends the vaccine whether a person recalls getting chicken pox as a child or not. Shingles can’t be transmitted to other people unless a person has not had chicken pox as a child. These people may develop classic chicken pox with exposure. The new vaccine (Shingrix) is not a live virus but requires a booster 2-6 months after the first. A slight rash can occur when receiving the vaccine. Patients who have had severe reactions to drugs or other vaccines (anaphylaxis) should not receive the new shingles shot without serious discussion wit their physicians. The shingles shot does not treat the shingles infection and should never be received if a patient is currently enduring shingles. Pregnant or lactating women should avoid the vaccine (no studies to prove safety). Although the previous vaccine protected about 50%, the new vaccine is much more preventative (90%). The price of Shingrix is $280 (not usually covered by insurance) for the 2 doses recommended. Discuss this issue with your physician. You may need a prescription to receive the vaccine. Kratom is a tropical botanical evergreen tree compound (grown in Southeast Asia—Mitragyna speciosa) that has gained popularity and falsely claims that it can get addicts off opioids (narcotics). 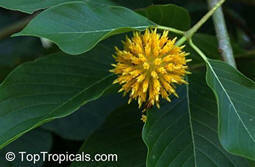 It has been used in Eastern medicine for the past 2 centuries. The FDA has just put out a warning that this compound sold in “head” shops (vapor shops, marijuana paraphernalia shops, etc. ), although currently legal, has 22 of its 25 compounds that act like opioids. They bind the same sites in the brain that these narcotics do and have the same psychoactive effects. People drink it as tea and use other methods to relieve pain, mood up-lifting, and as an aphrodisiac. Experimenting with substances has proven to be very dangerous. There have been 44 deaths since November, 2017. Sadly, most of these people had other illicit compounds in their blood stream at autopsy as well. The FDA states that kratom should not be used to treat medical conditions, or used as an alternative to prescription opioids. There is no evidence that kratom is safe. Tell your children and all young people not to use this dangerous compound. The influenza bug has been as severe as the 2009 epidemic of the swine flu. 1 in 10 doctor’s visit was for flu or flu-like symptoms this past month. Some were testing negative early and later tested positive. The actual flu bug changes from year to year, and it is a bit of a guessing game each year just what specific strains need to be covered. These viruses have a great ability to mutate making vaccines less effective. The latest results of coverage with the vaccine is approximately 43%. Effectiveness for specific strains vary: Influenza A(H3N2)-25%, Influenza A(H1N1)-67%, Influenza B(42%). The toughest strain is the H3N2, which caused the most significant illnesses. About a third have been protected. But that is not the real story. The vaccine has prevented 44,000 deaths since 2009 according to the CDC. Reducing the severity of flu because of the vaccine is very worthwhile. The greatest effectiveness overallthis year has been in children (59%), while those 18-49 were second (33%). 3 out of 4 children who died were not vaccinated. As of the middle of February, 84 children have died. The H3N2 strain has not been around for a few years, and when it showed up this year, the vaccine was not well protected against it as it was for the H1N1 Influenza A and the Influenza B viral strains, and thus the overall effectiveness was affected negatively. These studies are all observational and have limitations, so we will see the final outcome later in the spring. It is disconcerting to not have better drug treatments for the flu once a patient becomes symptomatic. Research dollars are not being spent on such treatments when Big Pharma is making a killing on the vaccine. Congress spends its research dollars on cancer, heart disease, and other killers. Research projects go unfunded every year. I previously reported that Tamiflu reduced the length of the flu by a mere half a day. Is that the best we can do?